Zack Novak picked up his first NASCAR PEAK Antifreeze iRacing Series win of 2018 at Chicagoland Speedway, holding off Ryan Luza on a restart with five laps to go. Luza looked to have the faster car, but a caution ended the race before he could make a bid for the lead. Bobby Zalenski finished third followed by Phillip Diaz, who earned his first top-five result of the season. Ryan Lowe came from 33rd on the grid to complete the top five. Novak took the lead by staying out longer than the leaders during the last green flag pit cycle and catching a timely caution when Brandon Pipgrass spun with 25 laps left. The yellow trapped Luza and Keegan Leahy, two of the favorites, back in traffic. With four more cautions to come in the last 20 circuits, Luza had little time to make moves while Leahy was caught up in a restart crash on Lap 148. Despite the cautions, Luza kept moving forward during the few green-flag laps between crashes, and with four laps to go he closed right to the bumper of Novak in Turns 3 and 4 before clipping the apron and losing a couple car lengths. The final caution waved just half a lap later and Luza had to settle for his sixth top-five finish in seven starts this season. In the chaos, three more strong drivers found themselves on the wrong side of the leaderboard. Ray Alfalla did not lead any laps but contended in the top five for much of the evening before crashing out in spectacular fashion on Lap 153. Ryan Luza and Jimmy Mullis were battling for fourth just ahead of Alfalla exiting Turn 2 when Luza made slight contact with Mullis, sending him into the outside wall. The sudden loss in momentum caused several cars to pile into Mullis’ stricken car, causing a massive pileup that saw Alfalla flip side over side down half the backstretch. Michael Conti paced the field for 34 laps before an unfortunate speeding penalty on pit road took him out of contention. The penalty combined with a caution that forced him to take the wave around to regain his lost lap relegated Conti to 18th. Jarl Teien, fresh off his second-place effort at Sonoma, won the pole and looked to keep his momentum going after a dismal start to the season. 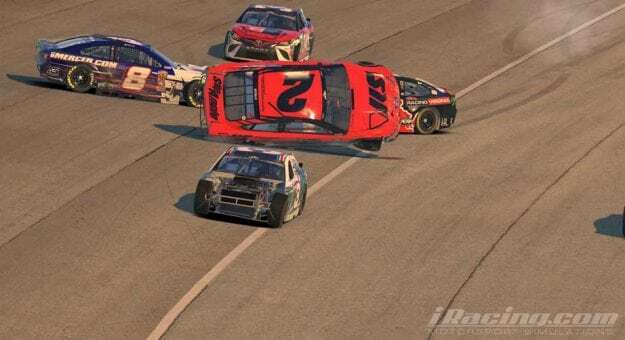 Initially, Teien looked strong and led 29 laps early, but he was trapped a lap down by a caution and wound up in the same crash that took out Alfalla. Teien finished 28th, putting a dent in his quest to make the top 20 in the standings. Zalenski took the points lead from Alfalla after the latter had trouble, but the margin is just only four points. Leahy sits third, 18 markers off the lead. Matt Bussa is an additional 15 points back in fourth, followed by Nickolas Shelton in fifth. Luza is currently sixth after his second-place run. With only four races remaining before the playoffs, the NASCAR PEAK Antifreeze iRacing Series will make its annual visit New Hampshire Motor Speedway. The Magic Mile is notoriously tough to pass on, meaning pit strategy could be brought to the forefront once again. As the stakes rise, will desperate drivers close to the playoff bubble try for a Hail Mary strategy, or will the familiar faces assume their usual roles at the front?